With every dish I cook in our cooking sessions I emphasize on learning the base sauces. 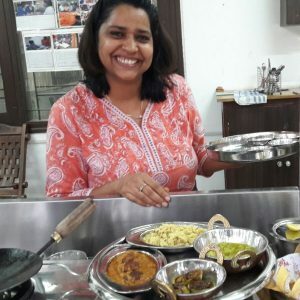 Indian cooking has never been taught in Culinary Schools, it is taught by our families confined to the home kitchens, hence it has not been documented in terms of its parts, bases etc. And there is no way you will know the basics, as here only the ones who wish to pursue a career as a chef or cook go for professional training. If you just want to learn it for the sake of learning you will never get to know its secrets as either it is taught on Industrial Level in Colleges or it is taught in billions of households on a micro level. A common food enthusiast will never get a chance to learn Indian Culinary Heritage in some designed course. My dream is to create Indian Culinary Academy that does not look for training people for Hotel Industry but give common people a chance of experiencing their passion for food and learn the Culinary Heritage of India. I don’t know if that will happen soon, so till then I will try to make it happen through my website. Hence emphasizing on Sauces is very very important. Learn the sauce–the base and not the dish only. Its like learning the theorems before to solving the problems in Mathematics. Lets gather ingredients for the masala paste as shown below for your base. Add all other ingredients and saute on medium high. We are not looking to cook it completely. It is just to make the ingredients softer and half cook. The onions will get softer in around 2-3 minutes. Now this is can also work as a marinade. Especially for Chicken, just add salt and 1 tbsp of yogurt to turn it into a great flavor for your next grilled chicken. Once the Paste is ready assemble the ingredients for next stage like in the below picture. Start with heating ghee and adding the powdered spices. Immediately add the cashew onion paste to stop overcooking and burning the powdered spices. Add Yogurt slowly and incorporate well, otherwise it will split. keep stirring for a minute and then introduce either Coconut milk or regular milk to create a sauce like consistency. Immerse paneer cubes and simmer for a couple of minutes till you achieve a smooth texture. Roll big Oval shaped chapaties. Thanks for sharing your masala making tips & it looks absolutely delicious. By the way I would love to enroll myself into your culinary academy. 🙂 I wish all your dreams come true!